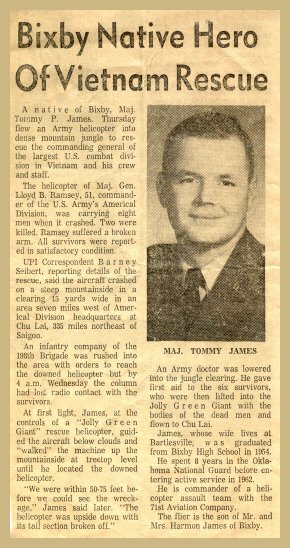 Tulsa Tribune – March 17, 1970 – A native of Bixby, Maj. Tommie Preston James, Thursday flew an Army helicopter into dense mountain jungle to rescue the commanding general of the largest U. S. combat division in Vietnam and his crew and staff. The helicopter of Maj. Gen. Lloyd B. Ramsey, 51, commander of the U.S. Army’s Americal Division, was carrying eight men when it crashed. Two were killed. Ramsey suffered a broken arm. All survivors were reported in satisfactory condition. UPI Correspondent Barney Seibert, reporting details of the rescue, said the aircraft crashed on a steep mountainside in a clearing 15 yards wide in an area seven miles west of the Division headquarters at Chu Lai, 335 miles northeast of Saigon. An infantry company of the 198th Brigade was rushed into the area with orders to reach the downed helicopter but by 4 a.m. Wednesday the column had lost radio contact with the survivors. At first light, James, at the controls of a Jolly Green Giant rescue helicopter, guided the aircraft below clouds and “walked” the machine up the mountainside at treetop level until he located the downed helicopter. An Army doctor was lowered into the jungle clearing. He gave first aid to the six survivors, who were then lifted into the Jolly Green Giant with the bodies of the dead men and flown to Chu Lai. James, whose wife lives at Bartlesville, was graduated from Bixby High School in 1954. He spent 8 years in the Oklahoma National Guard before entering active service in 1962. He is commander of a helicopter assault team with the 71st Aviation Company. The flier is the son of Mr. and Mrs. Harmon James of Bixby.